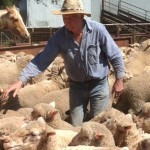 Pam & Tony Fitzpatrick have been supplying bio –dynamic lambs and beef to Rural Organics for many years. So, as these pics show, we thought it was a good opportunity to introduce Janie’s youngest granddaughter, Grace Elizabeth to one of Rural Organic’s oldest producers. 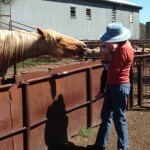 Together with her mum Alice, Grace E inspected the lambs with Tony, then joined Pam to make friends with their beautiful palomino horse Elly. 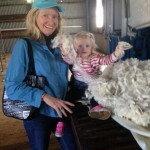 Finally, it was off to the Fitzpatrick woolshed to give Grace a feel of the beautiful white fine merino bio –dynamic wool. 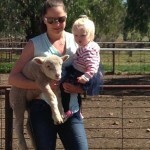 Janie, said of the day: “I really think that Grace Elizabeth has inherited her mums love for the land. This entry was posted in Uncategorized on November 12, 2014 by ruralorg.